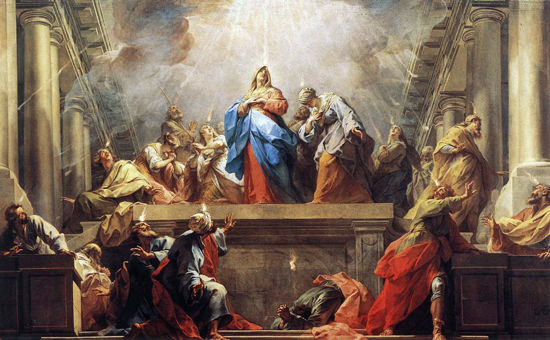 There is some sense to calling Pentecost the birthday of the Church, but it can be somewhat glib. You might say that the Church was born when Christ was born, or when water and blood, Baptism and Eucharist, flowed from Christ’s side on the Cross. You might even say that the Church was born with Adam and Eve and came to maturity when Jesus, the new Adam, and his mother Mary, the new Eve, greeted each other in the unrecorded instant before the break of Easter dawn. What we can say with precision is that on Pentecost the bond of love between the Eternal Father and the Eternal Son filled the Church. When Christ prayed the night before he died, he spoke of that unifier which is the Holy Spirit: “I made known to them your name, and I will make it known, that the love with which you loved me may be in them and I in them” (John 17:26). Father Rutler is Pastor of the Church of Our Saviour in New York City. Father Rutler, I have a question and an idea that might be good enough to help. Question: How closely related are sloth, complacency and presumption against the Holy Spirit? Would the devil want people to start with being complacent, move on to sloth and end up in hell because of presumption? I heard a priest once say in Mass that if someone has not called you a religious fanatic lately (today?) you are not living your faith correctly. God says in 2Thessalonians 2:10; “for those who are perishing because they have not accepted the (true) love of the (whole) truth so that they may be saved.” I add (true) and (whole) because they must be there although not stated explicitly by God. What does it mean to truly love the whole truth other than we should seek to know it and understand it the way God wants it understood and we should do all we can to help others love the whole truth also. 2. Show that we do not really care if God wants us to believe this idea or any other idea, show that we are too concerned with other (worldly) concerns and that we do not truly love the whole truth (whatever that is) that God is revealing for us to believe. God is truth and He wills to share Himself, all truth, with everyone. God does not expect us to know all truth in this world, (only in the next world where “partial knowledge ceases” CCC314) but, He will bless us only if we keep on trying, keep on working, keep an open mind and receive an “E” for humble effort giving all glory to God for loving us in spite of our sins of commission and omission. How sad it would be if a priest or minister could quietly, gently, without pointing a finger, remind every parent (present and future) of their responsibility to demonstrate the true love of the whole truth so that they MAY BE saved, and the minister says “I do not care if such a reminder may help someone, I am not going to do it”? Would many ministers refuse to join in such a public statement once a few started it?